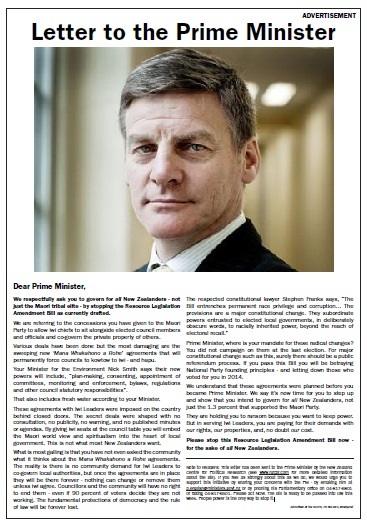 Please feel free to pass this newsletter on to anyone concerned about the proposed law change and urge them to contact Bill English. If you would like to support the work of the NZCPR, we would be very grateful – the link is HERE. Should the introduction of the Maori co-governance of local authorities be conditional upon the approval of a majority of New Zealanders through a binding public referendum process? Why, for generations, have the voting public so blindly voted National or Labour,? when people of Rodney Hide’s callibre have put their names forward & offered their services to the people through Parliament, yet only gained 6 or 7 per-cent of the population vote. No wonder N.Z. has become no more than an experimental launching platform for the Global Government. Catch phrase coming from the hard-core National supporters now is; ‘you’d be far worse off under a Labour-Green government. And that is proving to be the only thing they have to offer. A.G.R. Yes – providing any referendum is, in fact, binding on the Govt. I have stated on a number of occasions, that we need to remove all reference to race, colour or creed from our Laws and Statutes – we then all become equal under the Law. This should do away with all race-based bias and privilege in one fell swoop. Maori never “owned” land anyway – they merely occupied it until pushed off it by a stronger group. The concept of land ownership as we know it today came with the European and the iwi groups are milking it for all they are worth. Scott.